HB made a bright start to the game with Tór-Ingar Akselsen as constant threat on the left, and 8 minutes into the game, Tór-Ingar got to the byline and sent a low cross in front of goal behind the NSÍ defenders, and Rógvi Jacobsen had the easiest of tasks to tap the ball into the goal. But just 4 minutes later, the score was level again. The goal came from a direct free kick which Brynjolvur Nielsen hammered into the net. In the second half, HB was mostly defending, and although NSÍ midway into the second half was reduced to 10 men, it was still NSÍ who dominated. But not long after, HB lost the man in advantage, when defender Vagnur Mohr Mortensen was correctly sent off after a second bookable offense. NSÍ now put heavy pressure on HB and created several scoring opportunities. – In one incident, two NSÍ players were completely free with the goalkeeper, but neither of them managed to hit the ball. 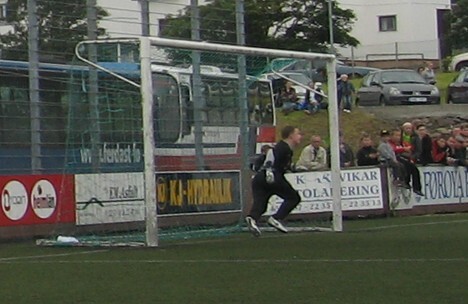 HB also created some opportunities, and once, goalkeeper Karsten Joensen, who substituted for a suspended Jens Martin Knudsen, parried a header from Rókur av Fløtum Jespersen on to the crossbar. HB were living dangerously but then, just a few minutes before the 90 minutes had gone, HB secured their victory when Ólavur í Ólavstovu played the ball across to Emil N. Leifsson, who scored with a low shot from long range. With the 3 points, HB take second position away from NSÍ and are now only 2 points adrift of EB/Streymur. But EB/Streymur have a game in hand against ÍF Fuglafjørður on Wednesday which they should win. NSÍ also have a game in hand and play against B36 on Wednesday. VB/Sumba made a giant leap – not for mankind, but out of the relegation zone by beating KÍ Klaksvík and at the same time effectively ended KÍ's title aspirations this season. VB/Sumba earlier in the week appointed former goalkeeper Bjarni Johansen and Finn Johannesen as new coaches, after Ole Andersen was recently sacked. The new coaches seem to have tightened up the defence, which has now held 2 clean sheets in a row after having conceded 54 goals in their earlier 18 games. With this kind of statistics, ÍF Fuglafjørður and B68 Toftir are going to find it very difficult to overtake VB/Suma again. ÍF ended Skála's winning streak of 3 games in a row, but ÍF will be bitterly disappointed with the draw as Skála didn't equalize until close to the final whistle with a penalty. ÍF are desperately in need of victories as 1-pointers aren't going to cut it, if they are to avoid relegation. B36 beat table toppers EB/Streymur to stop them from running away with the title and also gave themselves another last chance to get involved in the title chase again. B36 missed a penalty after 30 minutes, but took the lead just before the half-time whistle. EB/Streymur levelled a quarter of an hour into the second half and a couple of minutes later hit the crossbar before B36 secured the points 6 minutes after EB/Streymur's equalizer. B36 play again already on Wednesday, when they take on NSÍ Runavík. Nothing except 3 points will be enough for B36, if they are realistically going to challenge for the title. B68 is desperately in need of victories in order to avoid relegation and this evening they thought they had made it when Julian Johnsson brought them in front 10 minutes before time, but GÍ managed to equalize in the very last stages of the match. B68 now need 2 victories too overtake VB/Sumba in 8th spot, and with only 7 matches left, that's going to be very difficult - especially now VB/Sumba seem to have tightened their defense. This was GÍ's 7th match in a row without a win. 10 of GÍ's 20 matches have ended in a draw.